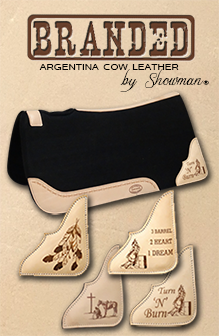 Showman ® Argentina cow leather single ear headstall. This headstall features medium colored Argentina cow leather with black and white rawhide lacing on cheeks, ear piece, and crown. Headstall is accented with copper conchos and buckles and has leather tie bit ends.